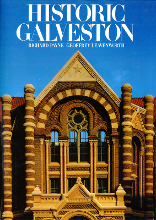 This site is an information resource for books about Galveston, Texas. Galveston is a unique city, rich in history and many books have been written about it. Our aim is to identify and list as many of them as we can. We stock most of the new books found here, and some of the out-of-print books when available. You can search for books by keyword or browse the database by category. Books presented here do not reflect our general inventory, only those books relating to Galveston and local interests.